Wellington, Fla. - Feb. 9, 2017 - Leatherdale Farms' performance horses were off to a strong start during the first few weeks of the winter season in Wellington, Florida, with Diane Creech and Sue Blinks. 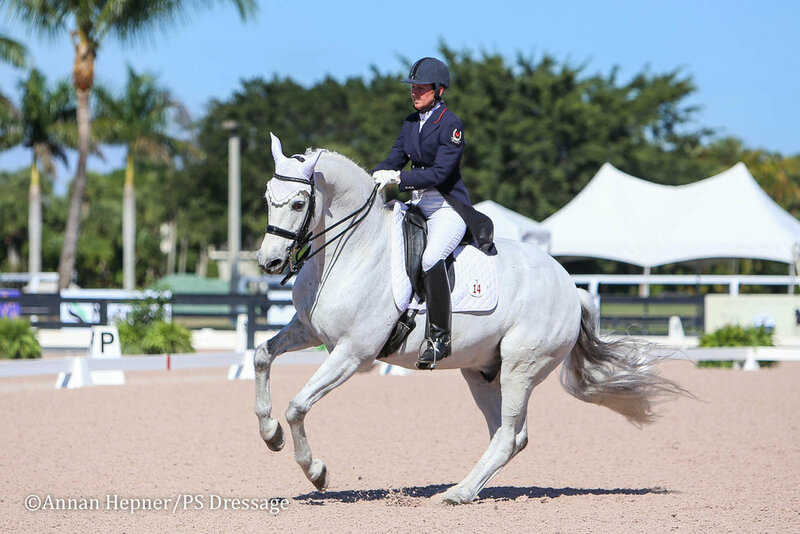 Olympian Sue Blinks kicked off the Adequan Global Dressage Festival (AGDF) aboard the 13-year-old Hanoverian gelding Habanero L (His Highness x Wolkenfee, Wolkenstein II). The pair won an Intermediate I national class with a 69.737 percent, and on the second day, they earned a red ribbon with a 69.342 percent. Blinks expressed her appreciation for the opportunity to ride and compete one of LeatherdaleFarms' talented horses, who she has been working with for a little over a year. "It's an honor to be a part of the Leatherdale Team," Blinks said. "Habanero is such a confident competitor - he's so focused and environmentally uninvolved. It's like the world isn't there and he just does his thing, which is pretty amazing. He's really good at collection, strong over his back and engages very well. I am really pleased with his consistency!" Looking forward, Blinks will work on improving Habanero L's strength to develop his Grand Prix work. "We will keep going in the ring at the small tour level until we feel like he's strong enough and ready to go up the ladder," she said. "We are going to let it happen as he's ready." Canadian Diane Creech rode multiple horses owned by Leatherdale Farm to wins throughout the first month of competition. During the second week of the Adequan Global Dressage Festival, Creech swept both the CDI Prix St. Georges with a 70.211 percent and the CDI Intermediate 1 with a 71 percent at the Gold Coast Opener CDI with Robbie W (Rubin Royal-Rolling Home), a 14-year-old Oldenburg gelding. "Robbie knows his job and what to do so he doesn't get phased - I love that about him," Creech explained. "He loves showing and he has a great attitude to present himself well. I was extremely pleased with our tests!" Creech also rode 14-year-old Danish Warmblood gelding Chrevi's Christo (Chrevis Cavallo - Chrevis La VI, Matador) and 10-year-old Hanoverian mare Diana C (Damsey FRH-Belinda, Brentano II) in the Gold Coast Opener Grand Prix. Chrevi's Christo won his class, earning a score of 68.500 percent, and Diana C also placed well with a 66.1 percent. "I am very pleased with Christo - he has gotten so much stronger and more consistent in his tests," Creech explained. "It was Diana's first time back in the ring since last season, but her confidence in the ring has improved so much." In a successful week three, Creech debuted 6-year-old Hanoverian gelding Dublin L (Damsey-EM Wibranda, Wolkenstein II) in Third Level at the AGDF, taking first in one class with 70.60 percent and placing second with 71.515 percent in another. "I was so thrilled with Dublin," she explained. "It was his first time doing a Third Level test, and he recently learned the flying changes. There's so much more in him, we haven't even scratched the surface." Dublin L's half-brother, Devon L (De Niro-EM Wibranda, Wolkenstein II), 17-year-old Hanoverian gelding, started off the season on the right foot with success in the Grand Prix, earning a 68.700 percent for second place, and later in the weekend, they won the Grand Prix Special with 67.451 percent. Creech was excited about his performance, which was his first after taking two years off from competition. "Devon has so much heart and really enjoys his work," Creech explained. "It was a great start to the season for our entire team. All the horses are maturing and growing up, so I'm very excited about the future with them." "I am grateful to have Louise [Leatherdale's] continuous support," Creech said. "She really enjoys watching the horses improve and move up to their potential. I really appreciate her very horsemanship focused philosophy and seeing their progression the entire way through."